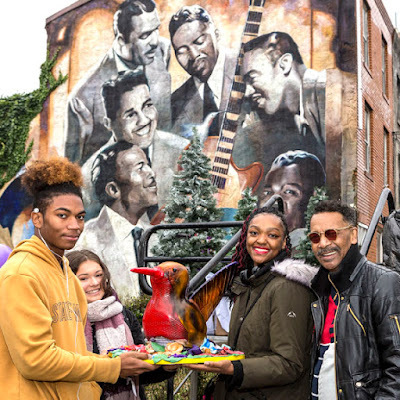 THE DIXIE HUMMINGBIRDS, one of the most enduring and influential gospel groups of all time, reached a significant milestone today in its yearlong “90th Anniversary Celebration: The Magnificent Flight of the Dixie Hummingbirds” with the hometown rededication of the Legendary Dixie Hummingbirds mural by Mural Arts Philadelphia. The original mural by artist Cliff Eubanks, at 859 N. 15th Street, was completed in 2005 to honor the Dixie Hummingbirds. It faces north at 15th & Poplar along Dixie Hummingbirds Way, just a block from the Metropolitan Opera House where the group often performed in the 1970s. That historic building will be reopening in grand style tomorrow as “The Met,” in a sold-out show starring Bob Dylan, who has acknowledged the Dixie Hummingbirds as an early influence growing up in Minnesota. The mural was rededicated on Dec. 2 in a gala ribbon-cutting ceremony featuring a list of prominent celebrities, officials and musicians, including Ira Tucker Jr., leader of the legendary group, whose late father, Ira Tucker Sr., became its lead singer in 1938 as the group signed with Decca Records and was first propelled to national prominence, ushering in the hard-singing style of gospel music's 1940s and 1950s golden age. 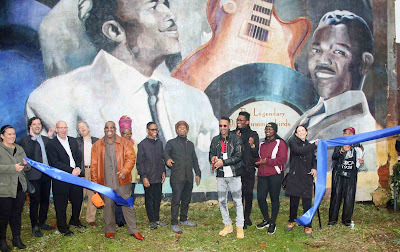 As part of the ceremony, Mural Arts also announced plans for a new complementary mural in honor of Sister Rosetta Tharpe, the “Godmother of Rock and Roll,” created by Ernel Martinez. Sister Rosetta Tharpe and the Dixie Hummingbirds, both of whom now have plaques on the Philadelphia Music Walk of Fame, had an extremely close personal and professional relationship for decades. In fact, says Ira Tucker Jr., the Hummingbirds originally helped push Tharpe into prominence. She was inducted this year into the Rock and Roll Hall of Fame. Dylan once described Tharpe as “a big, good-looking woman and divine, not to mention sublime and splendid. She was a powerful force of nature--a guitar-playing, singing evangelist." Also during the ceremony, Tucker issued a call for volunteer artists to design a billboard and poster for the Dixie Hummingbirds’ upcoming public service campaign dedicated to drug addiction awareness. Details of the campaign, titled “Straight Street,” after the song of the same that appears on the group’s newly reissued CD, Gospel Praise Songs – Powered by Quartets, will be announced at a later date. The Legendary Dixie Hummingbirds mural was funded by WXPN. The project is in collaboration with the City of Philadelphia. Their influence has spread not only over the world of spiritual music, but also inspired secular artists ranging from Jackie Wilson to Bobby "Blue" Bland to the Temptations. The Dixie Hummingbirds have been immortalized in the Vocal Group Hall of Fame, the Gospel Music Hall of Fame, and the American Gospel Quartet Hall of Fame. The Dixie Hummingbirds were formed in 1928 in Greenville, SC. They made their recording debut in 1939 on Decca, and their singles include "Soon Will Be Done with the Troubles of This World," "Little Wooden Church" and "Joshua Journeyed to Jericho." In 1942 the group relocated to Philadelphia, where founding member James B. Davis bought a house at 23rd and Girard Avenue, and used it as a rehearsal space. In 2017, the Commonwealth of Pennsylvania and the City of Philadelphia commemorated the rich heritage of the Dixie Hummingbirds with a historical marker dedicated there. The Dixie Hummingbirds are further immortalized in Philadelphia with a mammoth mural through the Mural Arts organization. The mural covers a building’s wall at 859 North 15th St., just a few blocks away from “Dixie Hummingbirds Way” at 15th & Poplar Sts. In 1988, the Dixie Hummingbirds were honored by the Philadelphia Music Alliance with a bronze plaque along the Walk of Fame. Most people know the Dixie Hummingbirds’ melodious voices from when they backed up Paul Simon on his 1973 hit “Love Me Like a Rock” and their own version of the song, recorded at Philadelphia’s legendary Sigma Sound Studios with Stevie Wonder and Paul Simon, that later won them a GRAMMY® Award for Best Soul Gospel Performance. The Dixie Hummingbirds were the subjects of the critically-acclaimed 1995 film directed by Ashley James, We Love You Like a Rock. In 2000, they were ceremoniously deemed a "national treasure" by the National Endowment for the Arts at the Library of Congress, Washington, D.C.
That same year, the Dixie Hummingbirds’ 1946 recording of “Amazing Grace” was inducted into the GRAMMY® Hall of Fame. One of their uniforms and GRAMMY award is on display at the National Museum of African American History and Culture in Washington, D.C.
Ira Tucker Jr., center, leader of the Dixie Hummingbirds, cuts the ribbon today to officially rededicate the Legendary Dixie Hummingbirds mural (background) in Philadelphia as part of the yearlong “90th Anniversary Celebration: The Magnificent Flight of the Dixie Hummingbirds.” Credit Robert Mendelsohn.